“Laughs, Love, and Lyrics Collection” is a collection of 3 wonderful movies. 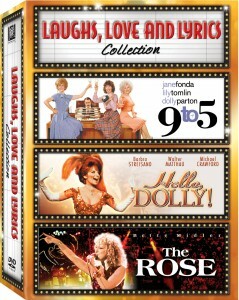 Includes: 9 to 5 (with my personal fav Dolly Parton), Hello Dolly!, and The Rose. This collection focuses on three women who know how to tell a joke as well as belt out a tune. This DVD trio spans across decades of humor, music, and tragedy. Dolly Parton, Jane Fonda, and Lily Tomlin elicits laugh in 9 to 5 (1980). Help – I have the song 9 to 5 in my head now and can’t get it out! Babs struts her stuff in Hello, Dolly (1969). Bette Midler will elicit your emotions in The Rose (1979). I have been given 3 copies of DVD Collection to giveaway to 3 Lucky Readers!! Easy Entry: Let me know which of these three movies you look forward to watching (or re-watching) by leaving a comment on this post! Use the Tell-A-Friend Feature at the bottom of the post to share this post with a friend, stumble, digg, etc. Ends around 5/15/09 at 11:59 EST. (As long as you can still comment you can enter!) Winner, chosen by random.org, will be announced on the Giveaway Winners Page by 05/16/09 and I will contact you shortly. (If winner doesn’t respond to my email within 48 hours, I will pick another winner.) Available for U.S. and Canada only. 9 to 5 is such a fun movie! I am looking forward to watching 9 to 5 again. That is MY SHOWER SONG. Almost everyday I sing it in the shower getting ready to come to my office. It’s the kind of movie you get more as an adult in the working world and you see the truth in some of it. I am a subscriber via email. Thanks! I would love to see 9 to 5 again. It’s been many years since I’ve seen it. Thank you for the entry. 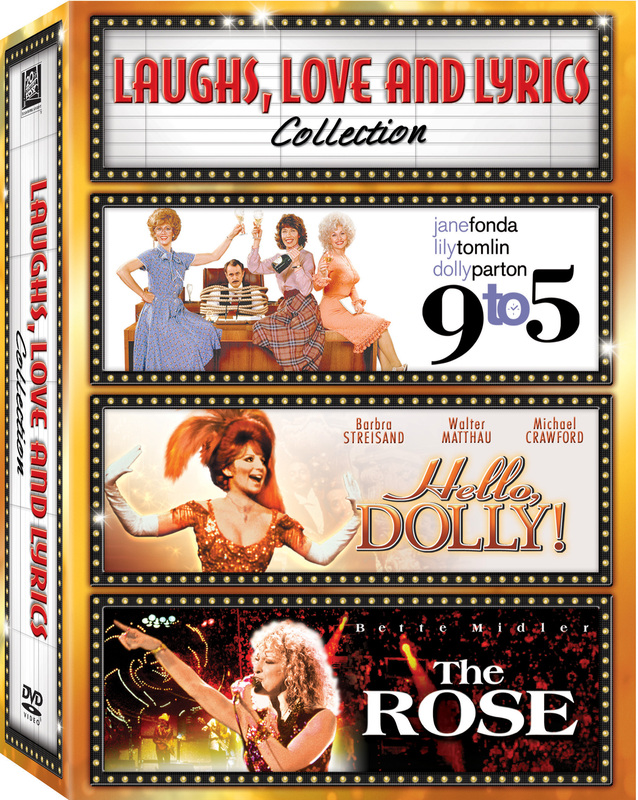 I love 9 to 5 and the Rose–looking forward to seeing Hello Dolly for the first time. I’d like to see 9 to 5 again. It’s one of those movies that’s still relevant today! Looking forward to re-watching 9 to 5. What great movies! I would love to watch Hello Dolly! I love 9 to 5 and would really like to watch that again and again. Thank you so much! Chancys last blog post..Go me! I adore Hello, Dolly! It’s one of my favorite musicals. It has been a LONG time since I have seen 9 to 5! 9 to 5 is one of my all time favs!!! 9 to 5 is a classic. I love that one. I haven’t seen The Rose in ages…would love to see it again. We love to watch musicals and this is a great collection! Thanks for the review and giveaway! My fav is Hello Dolly. I just love musicals but this one touches my heart. I am a Google subscriber! Thanks! I blogged about this giveaway! Thanks! 9-to-5 is one of my all-time favorites! Awesome!! Thanks! I subscribe via Bloglines reader! I loved 9to5! I remember watching it in my teens and it was just one of those movies that I knew I’d love to see again and again! I love Lily Tomlin! I’m looking forward to watching 9 to 5 again. Thanks for the chance. I have never seen any of these! I really like Bette Midler though, so I would watch The Rose first. I’d love to see Hello Dolly, I love Bette Midler, but have never seen this one. 9 to 5 was great, look forward to watching it again. hello dolly!!! i love that movie! and it’s almost impossible to find in stores. I’ve never seen Hello Dolly, but I’d like to! I’ve seen 9 to 5 and really enjoyed it but I would like to watch The Rose. Thanks! 9 to 5…..I remember laughing and singing along to that movie! I’m looking forward to rewatching 9 to 5 the most because I have never seen the other two movies! Nine to Five!! Thank you for the giveaway.